02/04/16 - Syndicated food columnist Linda Gassenheimer, Special wine correspondent Fred Tasker and WLRN host Joseph Cooper interview Chef Tanner Gill and sommelier, Heath Porter, both from Uvaggio Wine Bar. How about some smoked barbecue brisket for the big night? We to taste on-air along with other super bowl snacks. It's a Super Bowl Bash this week! This one-pot chili is perfect for 2 or a crowd for Super Bowl Sunday and is really easy-to-prepare. Chili is always a family or crowd pleaser. This variation using chicken and mushrooms gives a light, tasty result. All of the ingredients cook in a large skillet. It’s a meal on its own or serve some quick-cooking rice and a washed, ready-to-eat salad on the side. The chili keeps well and can be frozen. Make extra and save for another quick meal. Fred Tasker’s wine suggestions: I’d suggest an earthy pinot noir to go with the mushrooms in this dish. Heat oil in a large nonstick skillet over medium-high heat. Add the chicken and brown on all sides about 2 minutes. Add the tomatoes, jalapeno pepper, kidney beans, corn, chili powder, cumin, garlic and mushrooms. Bring to a simmer and lower heat to medium-low. Simmer, uncovered, for 15 minutes, adding a little water if it becomes too dry. Add salt and pepper to taste. Serve with chopped cilantro sprinkled on top. Toast bread and serve with the chili. Makes 2 servings. 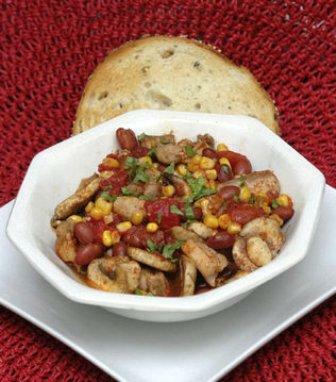 To buy: 3/4 pound boneless, skinless chicken thighs, 1 large can diced tomatoes, 1 can red kidney beans, 1/2 pound sliced button mushrooms, 1 loaf multi-grain bread, 1 jalapeno pepper, 1 small bunch cilantro (optional) and 1 small package frozen corn. Staples: Canola oil, chili powder, ground cumin, minced garlic, salt and black peppercorns. Any type of mushroom can be used. Buy them sliced or slice them in a food processor fitted with a thick slicing blade. Cooked chicken or turkey can be substituted for chicken thighs. 2 crushed garlic cloves can be substituted for minced garlic.